Born on May 8, 1911 in Hazelhurst, MS, his name is Robert Spencer, after his stepfather. As a teenager, he took the name of his natural father. In 1930 he met blues musican Son House and was deeply affected by his style. After his colleagues Son House and Willie Brown were astounded by his development, rumors began about Johnson trading his soul to the devil in exchange for the guitar expertise. He recorded his famous songs in 1936 and 1937, in San Antonio and Dallas. In 1938 he played his last gig in a juke joint named Three Forks, and died August 16. Many rumors occured about Johnson's death: stabbing, poison... or the devil catching up with him. Read here more about Catfish and Cotton - see some great blues video's... and above all: listen to them! about centuries old treasures and secrets? Here is all the information you need, right out of the so-called prophecies of Nostradamus that are in reality a code, to start a true treasure hunt and find the Lost Treasure of the Knights Templar somewhere in the realms of the abbey of Orval. Did the French royalists during the French Revolution have made up some quatrains of Nostradamus to conceal their War Chest... or were they simply using a Nostradamus Code? In 2008, while doing research for a new book on the abbey of Orval (Belgium) - its mysteries, its lost treasures, and Nostradamus of course -, I made some pictures and movies of the ruins of the old abbey. I didn't use the material and forget about it; my friend Marc Borms (www.embee.be) had better stuff. I didn't even look or listen to the movies I made in 2008, and did this only recently, in October 2012, while cleaning up my camera. Headphone on, I heard a faint voice, speaking French, which I didn't hear four years earlier. Was I listening to a French guide... or a monk, praying? Was there someone reading poetry? 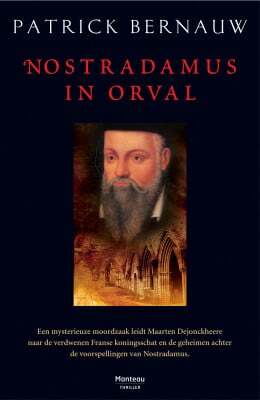 Then I recognised some words and sentences... as famous Nostradamus quatrains I had already written about, concerning a temple, a secret and a treasure, possibly situated in Orval. Could this be an example of the so-called "Electronic Voice Phenomenon" (EVP)... and the voice of Nostradamus, telling us where we should start a true treasure hunt? Or was it simply a practical joke? A hoax? they will come, in two parts to Orval, Herne and the white stone. the choice of Capet will be the cause of storm, fire, blood, axe. and they were led to a field of herbs. which for many centuries has been gathered. When found, a man shall die, the eye pierced by a spring. Law, the King and Prince Ulpian shall be troubled. Queen and Duke are in the pavilion under cover. The divine word will be struck from the sky. in a way they will march over and ahead? as a retaken, ravished and horrible prey in their midst! Beware! Here are Booby Traps! if it should be better to be a Breton or Norman King. The "one who is engraved in medals (coins?) of gold and silver"... Louis XVI? they will be reckoned as honors and praised. the end will come in very strange torments. and ravishing of the temples with the treasure in front.